The church offers a number of different youth and children’s activities and meetings, and you’re very welcome to join us. Click on the link below for details of the meetings and the age groups they are aimed at. These are informal meetings with activities, games and an evangelistic talk. 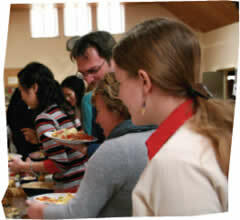 They are great places to make friends, have fun, and find out what Christianity is all about. They are led by an enthusiastic team of leaders who want to share the good news of the gospel with the children and young people, as well as providing fun and enjoyment for them. The church holds Sunday Schools for ages 3-11 during the Sunday morning service. Also, on a Sunday afternoon there is Bible Class for 18+ year olds, and young adults. These meetings are geared towards discipleship. If you are a Christian or want to find out more about the Bible, fellowship meetings like these can help you to grow in your knowledge of God and in your walk with Him. You can share experiences and ask questions, or just listen. It can be a real encouragement to spend time studying the Bible with other people your own age.